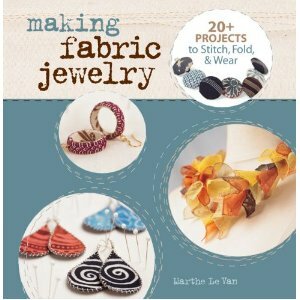 Marthe Le Van's Making Fabric Jewelry is the book for people who save fabric bits, buy Spoonflower swatches or have scraps from favorite clothes that are too small for quilts. Since some of the projects only use 2 or 3 square inches, they could also be made with charms. It starts with nearly 20 pages of basic information for getting started. It covers fabric, sewing techniques and basic jewelry making techniques. It's written well for people who are learning new techniques such as basic jewelry making techniques. While some of the projects use a sewing machine, a lot of them don't, which I appreciate. I like small projects that aren't noisy while watching television with my family. The projects are varied, showcasing fabric bits in a myriad of ways to fit the material and your personal style. There are many designers for lots of looks and techniques. Every project in the book uses techniques that can be easily adapted. It's all in full color with well written and photographed instructions. It's a natural for upcycling. Some pieces don't even need sewing. Like Deborah Boschert's Circles and Squares necklace which is done with fusible interfacing. That's one I plan to make using one of my Spoonflower swatches. My favorite project in the whole book is pictured on the cover, Miyuki Akai Cook's Kaga Earrings. They use a neat thread weaving technique and vintage fabric over a handmade paper core. I also love Anika Smulovitz's Jelly Fish pendant which uses scraps in a whimsical, fun way. There is a gallery of images for inspiration and eye candy throughout the book which show how many ways fabric can be used to make jewelry. Just a wonderful collection of projects, and I do recommend it. The range of projects will appeal to a wide range of people, and making jewelry with fabric is a great way to use a small scrap of something with lots of sentimental value or that's just too pretty to wind up as stuffing. Imagine turning a favorite concert tee that's just too worn to wear into a bracelet, or possibly a pair of earrings, or using old baby clothes to make a special pendant for a grandmother. This book will have great ideas and instructions for doing just that in a stylish way.